ESVIN Advanced Technologies Limited is involved in the promotion and development of innovative technologies to suit Indian conditions relevant to Pulp & Paper and Sugar Industries. Have developed applications of Gasification Technology, Biotechnology & Membrane Technology specific to Pulp & Paper and Sugar Industries. ThermoChem Inc., USA, a marketing arm of MTCI, is currently developing projects for production of liquid Biofuels such as Methanol, DME, Ethanol etc., by converting Biomass to Syngas (CO + H2) which can be further converted in to Biofuels. 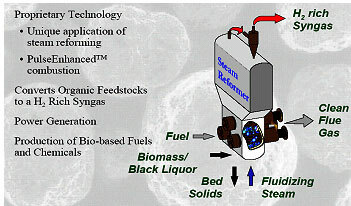 Taking advantage of this new market segment, namely, Biofuels, Esvin Tech is launching a new thrust for manufacture of Ethanol from Molasses by thermo-chemical conversion rather than by Biochemical conversion (fermentation route), as the former has the unique advantage of avoiding liquid effluent, which otherwise requires to be treated. In other words, this is a classical example of “pollution prevention” process as against the “end of pipeline” solution, which is required to be done for the existing distillery units. Even for these units, Esvin Tech has proposed a System (comprising evaporator, spray dryer and steam reformer) leading to “zero liquid discharge” effluent treatment system. Biotechnology involved development of Bio-pulping, Bio-bleaching and Effluent Decolourisation through microbial culture. Bio-bleaching was carried out through microbial enzyme and an Indian Patent was obtained for Bio-bleaching process. This division was hived-off to promote a Company called Esvin Biosystems Limited (EBL) in 1996. A Joint Venture Company (JVC) was promoted by EBL with an Australian Company called Biotech International Limited (BIL), Perth, in October 1997 and the JVC was named Esvin Biosys International Limited (EBIL), headquartered in Chennai, India. Biotech International Limited,(BIL) a leading Pharmaceutical Company, headquartered in Brisbane, had assigned to its !00% subsidiary called Industrial Biosystems Limited, Perth the development of B230 Xylanase Enzyme up to the level of commercial scale. Development and up scaling of B230 Xylanase Enzyme was carried out by EBIL with fermentation facilities available in and around Chennai. Commercial manufacture of B230 Xylanase Enzyme was established at the production facility of a leading Enzyme Manufacturer in India. 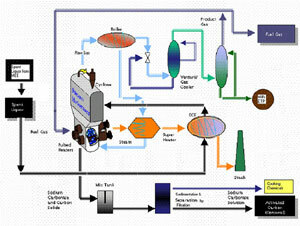 Mill scale trails with this Enzyme have been successfully completed in few Indian paper Mills since January 2001. But the Indian company could not continue due to change in the Management of BIL and funding problems. This technology was developed in technical collaboration with a leading confectionery manufacturer in the country for production of Liquid Sugar by adopting Electro dialysis (ED) process. The initial concept of the technology was jointly developed with CSMCRI, one of the CSIR Institutions in India. Pilot scale testing was successfully carried out at Ponni Sugars by importing the ED stack from France and the Liquid Sugar closely matched International norms. An Indian patent was obtained jointly in the names of Esvin Tech and the Confectionery manufacturer.